THE MACHINISTS OF JOY - DIE KRUPPS release their first all-new album of the millennium! After genre-defining releases in the 90s and 80s the band, which the media tried to categorize as Electro, EBM, Industrial, Crossover and even Metal, DIE KRUPPS returns with brand new material. DIE KRUPPS have opened the gates once again to their factory, after some years of running tests and high maintenance. Both 'Risikofaktor' (Risk Factor) and 'Industrie-Maedchen' (Industrial Girl) reached the pole position in the German Alternative Chart (DAC), where they stayed for several weeks. Now it's back to top form, with the first new prototype leaving the assembly line: THE MACHINISTS OF JOY. The album title hints at its content, referring to the KRUPPS´ Top 10 Billboard-Hit from 1989: "MACHINERIES OF JOY". As the title implicates, the electro machinery rules the new DIE KRUPPS-sound. However, the rigorous riffs of guitarist Marcel Zürcher's are effectively well placed in the songs. DIE KRUPPS continue to deliver Metal MACHINE Music – an attitude which is underlined by the clever ARTWORK-QUOTE. It is not a LOU REED clone, but frontman Jürgen Engler, who is depicted on the album sleeve! It is an homage to the VU-singer's seminal work, with Metal Machine Music having been a major influence on the early DIE KRUPPS. Machine Music, hard, danceable, sometimes epic, spiked by well-aimed guitar attacks and the relentless hammering of the steelophone! The music is paired with often sarcastic lyrics, well ahead of what nowadays seems to be the standard norm of political correctness. These 13 songs are not just for the Industrial-Dancefloors, they should also be heard at rallies and protest marches, on the barricades and in the workers canteens! While KRAFTWERK sing about Neon Light and Showroom Dummies, DIE KRUPPS topics are Factories of Dirt (Schmutzfabrik) and Angels of Steel (Engel aus Stahl)... in their native country they have been called the blue collar Kraftwerk. This could be explained by geography – as both bands originated from the city of Düsseldorf. 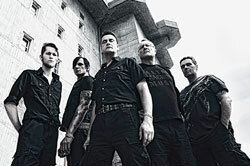 DIE KRUPPS continue to sing in GERMAN and selectively in ENGLISH, given the fact that DIE KRUPPS are among the few successful Industrial-Exports of German origin. The base of the machinists has also become very international. The album was conceived on the production axis Austin - Hamburg - Düsseldorf - Spain.